This is Kayla our newest vet tech/ receptionist. She was born and raised in Kansas where she went to school to be a CNA. Last summer she moved to Washington where she decided she wanted pursue a career with animals. 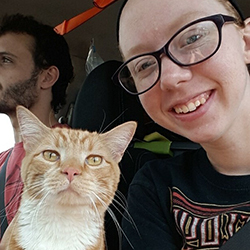 When not working Kayla likes to spend time outdoors, dog walking, and snuggling her two cats Ringo and Floyd.